Minors are available for undergraduate and graduate students interested in developing skills in a specialized discipline to enrich their knowledge and skill in their own discipline, prepare for an advanced degree, pursue an interdisciplinary course of study, or to satisfy intellectual curiosity. Undergraduate minors are typically 24 credits. Most can be completed as part of the student’s four-year plan of study. Graduate minors are typically 12 credits. Speak with your academic advisor about your minor options. The Animation and Visual Effects Minor requires the completion of eight courses. The minor provides basic foundation in the technological, story-telling and design skills used by animators and visual effects artists in the highly competitive entertainment and design worlds, with the opportunity for individualized tailoring according to the student's interests. A minor in architecture gives students majoring in other disciplines an opportunity to explore architecture through a coherent sequence of coursework. The minor in architecture can also be used for preparation towards professional graduate study in this field. Interested students should consult with the architecture advisor for course selection and scheduling. The minor requires 27 credits divided among design studio courses, courses in architectural history, and architectural elective courses. No more than 9 credits from a student's major can be used to fulfill the minor requirements. The history of art focuses upon the study of works of fine and applied arts and forms of mass communication in their aesthetic, social, economic, religious and political contexts. It explores the meanings and purposes of the visual arts, their historical development, their role in society, and their relationships to other disciplines. The study of art history encourages the development of critical observation and visual analysis; it introduces scholarly research and provides a working knowledge of a variety of monuments. As the field of art history is inherently cross-cultural and interdisciplinary, its study illuminates the diverse and global world we inhabit and makes apparent the integral relationships between art and culture. The minor in art history provides a broad humanistic background not only for students planning to attend graduate and professional schools in the fields of applied, media and design arts, social and information sciences, education, business and medicine, but also for those entering a more general job market. The minor is designed to be flexible enough to appeal both to Westphal College of Media Arts ∓ Design majors and majors from the other colleges. The minor requires students earn a total of 24 credits by completing eight of the courses listed in the course catalog. The 24 credit minor in dance offers students an opportunity to explore dance in the studio through technique classes, and in the classroom through academic classes in dance. Participation in the dance ensemble class(s) is required, although performance with the ensemble is not. There is no audition for the dance minor program. The Digital Media Minor requires the completion of eight courses (minimum 24.0 credits). The minor provides basic foundations in digital media, including; 3D animation, game art, and interactivity with the opportunity for individualized tailoring according to the student's interests. Drexel's Entertainment & Arts Management (EAM) minor provides students with an introduction to the exciting and challenging industries of entertainment and the arts, businesses with global revenues of two trillion dollars annually. The minor introduces students to finance, strategic planning, marketing and promotion, artist management, entertainment law, and intellectual property. The EAM minor offers a core of four required courses and students choose three additional courses according to their interests. The flexibility of the Entertainment & Arts Management minor's curriculum allows students to pursue deeper study in fields such as film and television, fine and performing arts, and event and venue management. The minor consists of 24 credits and includes Writing Intensive Courses. The Edinburgh Fringe program and EAM@sea Cruise: Tourism Entertainment are open to all Drexel students. The Minor in Film Studies comprises courses that cover the major artistic and institutional developments in cinema from its late-nineteenth-century origins to the present. As these courses cover a variety of critical topics that are essential to any film studies curriculum - such as the study of major genres and auteurs, the technologies and techniques contributing to the development of the medium, as well as the historical circumstances that influenced the cinema's evolution since its inception - they will establish a sound critical foundation for students to choose and to flourish in the subsequent courses required for the minor. The Fine Arts minor enables students to develop skills and concepts in the studio arts. Students in studio courses learn to combine skills in using tools and materials, visual theoretical concepts, and new technologies, all of which are necessary for design professionals. To be eligible for the fine art minor, a student must have completed a minimum of 30 undergraduate credits, have a declared major, and have a minimum GPA of 2.7. the academic requirement of 24 credits for the minor must be completed at or before the time of graduation. Basic design pre-requisite courses are required for most Art & Art History courses, and some of these may have already been taken for a student's major. However, only nine credits of major-related coursework can be applied to the 24 credits required for the minor in fine arts. Students with design credits from other schools or departments may be allowed to apply them to their pre-requisite requirements only upon review by the fine art minor faculty advisor. For more information on the Fine Arts minor, contact Bruce Pollock. Why Minor in Graphic Design? The Graphic Design minor offers coursework focused on the connection between design and technology, with hands-on courses focused on digital design, composition, corporate identity, typography, publication design, and photography. Students who minor in graphic design go on to explore careers in marketing, web and UX design, photography, illustration, entertainment, public relations, and more. The minor features an individualized approach with core focuses on developing skills around medium, content, context, and technology. It places emphasis on critical thinking, analytical reasoning, written and oral communication skills, integrity and ethics, while teaching technology as a tool. This is a perfect minor for those majoring in Fashion Design, Art History, Animation & Visual Effects, Film & Television, Interactive Digital Media, Product Design, Marketing, Communication, Computer Science, and others. 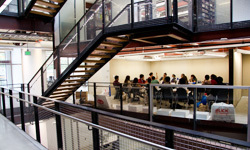 Classes range from visual communications basics to designing for media to digital design tools. Writing Intensive Courses like Graphic Design: 20th Century and Beyond. The minor is comprised of 24 credits. To learn more, please reach out to Program Director Bill Rees or Assistant Director of Recruitment Tia James. The Interactive Digital Media Minor requires the completion of eight courses. The minor provides basic foundations in interactivity, including: design and development of websites and mobile applications with the opportunity for individualized tailoring according to the student's interests. It is open to all University students and is administered and advised by the Digital Media program. he Interdisciplinary Smart Initiatives Minor provides students across the University an experience of both breadth and depth through multi-disciplinary practices and learning. Students will develop skills and knowledge in the topics associated with problem solving, innovative technology, leadership and immersive participatory experiences. Skills and knowledge will be delivered through collaborative teaching and coursework, skill building, experimentation, experiential learning, and engaging research initiatives. This minor provides the opportunities to engage in a variety of University venues and initiatives that places students on the leading edge of their chosen paths. The Interdisciplinary Smart Initiatives Minor is intended to build on experiential learning that is the foundation of a Drexel education. The minor in Jazz and African-American Music takes advantage of our faculty expertise in those areas. This minor can include course work in Jazz History, African-American Music, Jazz Theory, private study in jazz performance, and ensemble work in several ensembles devoted to jazz. The minor in Music requires 26 credits, including work in Music Theory, History, Applied Music (class or private lessons), and ensemble performance, and 9 credits of music elective. The minor in Music Performance requires two years of private lessons study with our artist faculty, culminating in a recital. The Music Program will provide support for the recital venue and accompanist. The minor in Music Theory and Composition is aimed at people who are writing their own music or who would like to begin doing so. You'll take courses in Music Theory, Arranging, Composition, and Digital Composition, and end with a portfolio of several completed pieces. Designed for the student who wishes to explore the fields of dance, music and theater rather than specialize in one area, the minor in Performing Arts provides motivated students the opportunity to learn about all three areas while performing for two years in one or more of the department's performing groups. Interested in learning more about the Performing Arts programs at Drexel? Download the 2016-17 Performing Arts Program Brochure [PDF] or visit the Performing Arts website. We are pleased to announce the addition of a Photography Minor into our program. The new minor in photography gives students a thorough understanding of photographic practices using a combination of aesthetics and technology. This flexible minor has been developed to accommodate both Westphal College of Media Arts and Design majors as well as majors from any other college. It is an excellent choice for students who are majoring in marketing, communications and journalism. Many employers in these fields are now routinely requesting that candidates have a good working knowledge of Photoshop and photographic practices. If you are interested in adding the Photography Minor, please email photog@drexel.edu to set up an appointment with the Photography Program Director, Professor, Paul Runyon. You will also need to complete the Application for Admission to a Minor Program Form which must be signed by both your current advisor and Professor Runyon. The minor in playwriting is intended to guide students from the acquisition of foundational playwriting skills through the completion of a full-length stage play. Fifteen of the credits are directly craft-oriented, teaching students what they need to know to translate their ideas into a format suitable for production on the stage; the other nine credits are dedicated to background knowledge intended to inform creative thinking and develop a student's individual voice. Students pursuing a theater minor should note that common courses in the playwriting minor make this course of study a relatively simple addition to their education. The playwriting minor is open to all students in the university. The Product Design program prepares students to become designers through experiential studio learning, skill development, and design thinking. Drexel's BS in product design specializes in multidisciplinary design research focused on product development and commercialization. It will also encourage collaboration in green design, sustainability and innovation in product development, facilitating and combining the fields of art, business, engineering and technology Product designers work in a wide range of industries including consumer electronics, housewares and furniture, fashion accessories, medical devices, toys, automotive and transportation. More than ever, the world needs people who can create meaningful ideas. With a curriculum that encourages discovery, experimenting, making and learning, the Product Design Program at Drexel University seeks to stimulate great ideas. A design education is the process of discovery. It activates experiential learning and empowers the mind to make new connections, synthesize new meanings and create novel solutions to difficult problems. With its Product Design curriculum, Drexel has developed a program that will let you discover and follow your passions while offering a full university experience with hands-on learning to help you find your affinity and inspire others. The Retail minor, administered by the D&M Program, provides basic foundations in retail operations, buying and merchandise planning and e-commerce. The curriculum allows the opportunity for individualized tailoring according to a student's interests. The minor is open to all Drexel University students, and requires the completion of eight or nine courses for a minimum of 24.0 credits. Contact Joseph H. Hancock, II for questions. The Screenwriting minor is intended for the student who is interested in learning the basics of crafting a screenplay as a complement to another area of study. The student will receive a grounding in major works of American and European cinema, and be taken through a course of study ranging from an introduction to the basics of writing for the screen up to the completion of a full-length screenplay. The minor requires eight courses, for a total of 24 credits. An understanding of movement and body language has become increasingly important across many fields including Communication, Corporate Training, Movement Therapy, Education, Performance, Rehabilitation, Sport and Fitness. Physical health, clear communication and effective leadership all rely on an awareness of how we carry our bodies through our lives. The Somatics Minor provides an in-depth study of the body, building from an understanding of its functional/structural basis, to its patterns and habits. We focus on how to interpret, analyze, and articulate somatic concepts and develop strategies for application. The Sports Media Production Minor is a gateway for students committed to pursuing a career and a meaningful introduction for those who are intrigued but uncertain about sports media as a profession. Students are required to take the same foundational shooting & lighting, editing, sound, and studio operations courses as the TV Production and Media Management and Film and Video majors and minors. They are also required to take a TVIE sports media strategy course as well as SMT digital and sports media history courses that will provide a greater academic and contextual understanding of the profession. With additional courses in actual physical production, on-air performance, and technology courses. The Sustainability in the Built Environment minor gives students a perspective on the built environment and the challenges associated with the 21st century. The minor is open to all Drexel University students and benefits from cross disciplinary student involvement. Required courses include Sustainable Design: History and Theory; Sustainable Built Environment I & II; Collaborative Research in Sustainability; and campus wide elective opportunities. Students enrolled in the minor will have opportunities to work on interdisciplinary collaborations including community engagement design and electives such as native plants and ecology; and community design build and other projects related to urban sustainability. The intent of the SBE Minor is to prepare students to engage and analyze future design challenges from a sustainability perspective. Students completing this Minor will be able to approach these challenges in a resourceful and insightful way with a solid foundation of sustainability principles. The emphasis on collaboration and trans-disciplinary teamwork will allow our students to serve as agile leaders in their future careers and be active participants in the critical discourse of our field. The Minor requires students earn a total of 24 credits. Interested students are encouraged to contact sustainability minor program coordinator Assistant Professor D. S. Nicholas at dsn35@drexel.edu. Students with a 3.0 or higher G.P.A. may apply for the TV Industry & Enterprise minor program. Once accepted, they take 21.0 credits of required courses that provide a basic foundation in the historical, financial, and programming elements of the television industry. The remaining 6.0 credits of study provide students the opportunity to have more hands-on production experience and/or to delve more deeply into the academic study of a specific area of interest. Students with a 3.0 or higher G.P.A. may apply for the TV Production & Media Management minor program. Once accepted, they take 21 credits of required courses that provide a basic foundation in the technical, historical, and creative elements of television production. The remaining 6 credits of study provide students the opportunity to have more hands-on production experience and/or to delve more deeply into the academic study of a specific area of interest. The Theatre Program at Drexel consists of two distinct, yet closely integrated components: Academics and Performance. The intertwining of foundation studies and practical application empowers students to discover and develop their own voice and style in their art. With practical courses in Performance, Administration, and Technical Theatre, students explore areas of interest, develop their skills, and gain a deeper understanding and appreciation of the practical side of theatre. In addition, the program serves the entire Drexel Community with engaging productions creating life-long supporters of the arts. Through the study of theatre, students learn more about culture and society and gain a greater understanding of the human condition. In short, they learn about themselves and how they communicate and interact as human beings. Working on Theatre Program productions they interact with students from many different disciplines, and cultural backgrounds as well as professional artists currently working in the field. Skills learned in theatre courses include fundamental craft based approaches of analysis and imaginative preparation, creative risk taking, collaborative work across disciplines, active listening, techniques for giving and receiving constructive feedback, critical observation, and problem solving. All of these skills will be useful to students in every area of life and in every career where communication is important. Students with a 3.0 or higher G.P.A. are invited to apply for the Video Production minor degree. Once accepted, they take 15 credits of required courses that provide a basic foundation in the technical elements of film and video production. Through the remaining 9 credits of study students can explore the application of those elements in a variety of intermediate courses, including Documentary, Experimental or Narrative Video. The Virtual Reality (VR) & Immersive Media Minor provides a foundation in the principles, techniques and tools used in the design and production of virtual reality (VR), augmented reality (AR), and other forms of immersive media, with the opportunity for students to customize their curriculum according to their own interests. As a relatively new but cutting-edge field, immersive media includes augmented reality, virtual reality and extended reality, fields that will revolutionize how we learn and what we experience, touching on virtually every aspect of human existence. Why study VR and AR? Immersive media technologies create the potential to put players inside the landscape of a video game and viewers inside the action of films and television. Through immersive media, students in their classrooms and people in their homes can experience visualizations of any historical site or museum in the world. Shoppers in stores or online can virtually try on and customize clothing and goods they wish to purchase. Immersive media is in use to create simulations that train surgeons, pilots, first responders, athletes, and countless other professions. Companies like Disney, Children's Hospital of Philadelphia, YouTube, and the US Department of Defense already have VR & AR divisions and team members. The minor is comprised of 24 credits and is open to students with a 3.0 GPA or higher. The Graduate Minor in Arts Administration enables interested students pursuing other graduate degrees at Drexel the opportunity to learn about the business structures and policy systems of creative enterprises, and to understand the basic operations of arts and cultural organizations. The graduate minor in Digital Media is open to all students outside the Department of Digital Media. It offers an introduction into digital design including 3D modeling, animation, interactivity, gaming and digital media history, theory and methods. Museums encompass many disciplines including art, history, science, anthropology and archaeology. The Museum Leadership graduate minor enables students pursuing an MS degree in another discipline to get a basic understanding of how museums function in contemporary society in preparation for entering a museum career. The Retail & Merchandising graduate minor, administered by the Retail & Merchandising graduate program, provides students with a competitive advantage when searching for a career in the retail industry. With the theoretical and applied knowledge gained from this online minor, students will be able to obtain national opportunities in growing professions, such as retail corporate management, retail sales management, retail operations corporate buying and merchandising, and postsecondary retail and merchandising education for community colleges. The certificate in dance studies is a 1-year option for any qualified professional dancer to assess whether they have the interest and aptitude for entering an undergraduate dance program. The certificate program has no entrance requirement beyond possession of a high school diploma or GED equivalency. All credits earned in the certificate of study in dance will be transferable into the part-time or full time BS degree in Dance.